The key things to remember when you are going to a casting are to look tall and look in shape. In the summer its pretty easy to pick anything that would compliment your shape but in the winter most people tend to wear clothes that can be a bit on the bulky side. (I mean its winter, we have to keep warm somehow!) I’ve gotten a lot of questions lately on what to wear to a casting if you happen to live where its cold this time of year like me. 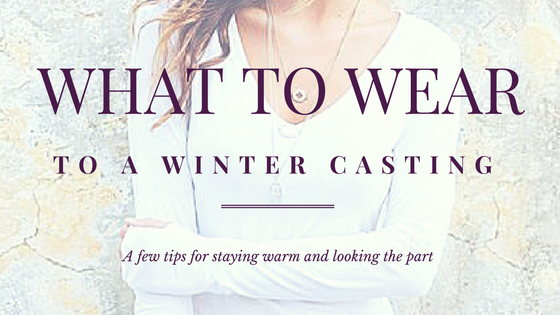 Check out my suggestions on 5 outfits that are appropriate to wear to a casting in the winter months. Wearing a plain white tee is the perfect addition to your casting attire. It doesn’t take away from your facial features and being that it should be form fitting it would show you body shape. Sure you might be cold when you wear only a T-shirt, but the point of me posting this is to show that this is what you can wear UNDER a large sweater or jacket. They key to staying warm in the winter is to wear layers. When you get to your casting, remove the layers until you get to your form fitting long sleeved t-shirt. What do you like to wear to winter castings?